Standard steel screw posts are the same size and shape as our industry standard aluminum screw posts. 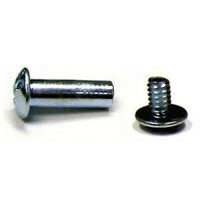 You can use these interchangeably with aluminum screw posts, anywhere you need the greater strength of steel. 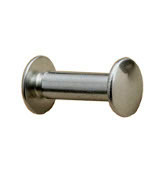 Heavy duty round head screw posts are thicker and heavier than our industry standard aluminum screw posts. They also have a rounded (domed) head instead of the flattened head that the standard screwposts have. These are normally used only when the highest strength is needed, such as for holding carpet samples and other extremely heavy materials.